Gilgamesh is the second oldest recorded fiction story in the world, also originating from the city of Uruk in the ancient civilization of Sumer. Gilgamesh the King, retold and illustrated by Ludmila Zeman, is the first in a trilogy of gorgeous, simple picture books, a perfect length for reading aloud at a book club meeting. I found the conflict a little more difficult to identify in this story. Gilgamesh wants to be the most powerful person in the world, but what he needs is a friend. He is battling his own nature, but he also fights Enkidu for supremacy. And, clearly, the people of the city also need mercy. 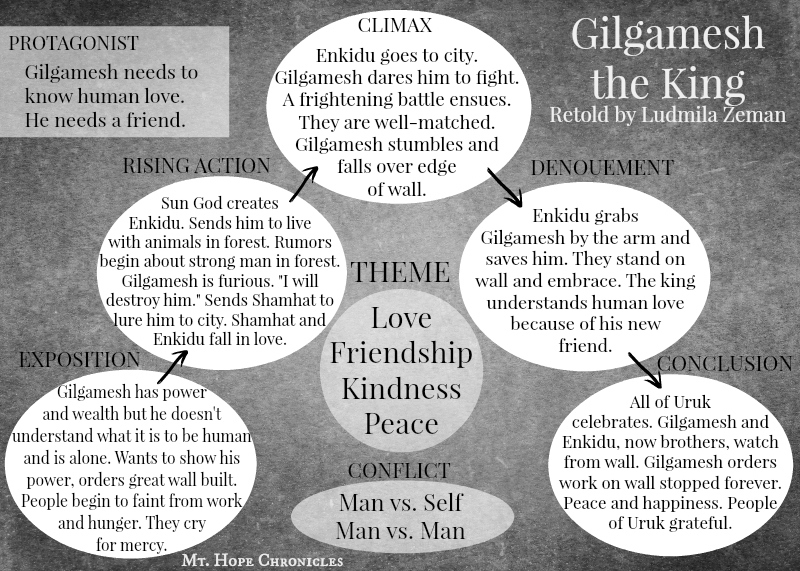 The battle between Gilgamesh and Enkidu is the turning point for all of these, though, and it symbolically takes place on the great wall. Gilgamesh does not get what he wants but he gets what he needs, and the people also get what they need and want as a result. Thank you so much for taking the time to do this series. I am just beginning a book club this coming week and am inspired by your posts. We will be covering all the books in the Narnia series, I hope. Its a mixed bag of homeschooled, Catholic school, and public school kids so a real reflection of our community. We are adding in having tea, sewing/knitting/spinning, geography, botany (its early spring here), and making our own countries! The crafts, botany, ect are to help develop "content" for each county. I envision the book discussion driving choices on relations with neighbor counties (the others in the group), county symbols like flags and anthems as well as discussions on who the people of their country are-Who is the country for ?, when in time does it exist, what are the people of the country proud of? So hopefully we can relate the setting, characters, themes, conflicts, resolutions,ect of story into creating one ourselves. A number of the kids play Mind craft at school. Their parents want their kids to read more and to get more out the books they do read. We are hands-off with technology as much as possible to give this group of tweens/early teens a chance to create by hand. Please pray for us, its a huge undertaking. That sounds like an incredible group, Alicia! I want to join. :) I will be praying for you as you get started! Thanks for sharing.